We value the special qualities of the Forest and seek to promote and protect them as the only all-inclusive organisation promoting its well-being. We campaign against threats and embrace change for the better and seek to make it happen. Our key activists are enthusiastic and committed. We are hoping to recruit a number of new people to help to make this happen, so you would be part of a small re-energising renaissance, working with an enthusiastic and committed Chairman and Vice Chairman. Our Honorary Secretary stepped down at our AGM on 21st April. An organisation without an Honorary Secretary is very much a ship without a rudder. This is not where we want to be. With important issues facing the New Forest we need to be going forward and campaigning in an organised and effective fashion. If you want to make a huge difference to an important charity, this is the role for you. During our 150th anniversary year in 2017 we ran a series of member events through the year. These were greatly appreciated and we would like to continue to offer enjoyable and informative New Forest events. The Events Planner would work with trustees and members of our Council to generate ideas and contacts for an events programme. There is a need for someone to monitor our online events booking system and liaise with the event leader and those who have booked a place. We are seeking to strengthen our Planning and Transport Committee with additional members who are interested in the issues and potential impacts on the New Forest of planning policies and planning applications. INTERESTED TO KNOW MORE ABOUT ANY OF THESE ROLES? England Coast Path proposal shows new Rights of Way on one map (middle right), Habitat Exclusions on another in a different document (top), and both maps do not show the relevant Site of Special Scientific Interest (bottom), a small fraction of which is in the Exclusion. I’d hoped that my previous presentment on the England Coast Path would be the last, and thank the court yet again for its inclusion in unusual circumstances. The complexity of the proposal demands a bit more, the longest of the 31 (of 66) published to date, including a Sensitive Features Appraisal running 222 pages, nearly 5 times larger than the average (excluding itself), and twice the size of the next largest (Burnham-on-Crouch to Maldon). The maps Natural England provide are misleading as they do not adequately reflect the key spatial relationships between the path, protected habitats and coastal margin. At a minimum Natural England should provide useable maps for comment, and extend the consultation proportionately to reflect the scale of the proposal. They should also be at pains to perform a complete Habitat Regulation Assessment and resolve the rife inaccuracies in the features appraisal. Guidance 2.4.6 As on other land with access rights under Part 1 of CROW, a person with a dog must keep it on a short lead in the vicinity of livestock. The purpose of this provision is to prevent dogs from approaching livestock. We hope the Verderers, in their statutory role on behalf of commoning, will request that this is applied in all possible instances. The NFA, for our part, will go further asking that dogs be kept on leads for any portion of the route that is adjacent to protected habitat, grazing which may be used by livestock, or spreading room leading to either habitat or grazing. [*] The Coastal Access Scheme 2013, page 14 – this guidance document was mandated under the Marine and Coastal Access Act 2009 Section 298 The coastal access scheme. The first version of the Scheme (NE268) was approved on 23rd March 2010, under section 298(2) of the 2009 Act. Section 299(2) of the Act required Natural England to complete an initial review of the Scheme within three years, which they did, publishing that result 11th July 2013. However, by that time they had only had three stretches published, and one of those approved. We have secured an agreement with one of the statutory consultees that we will request that the Ordnance Survey not depict “coastal margin” the spreading room associated with the route at all for our stretch of the coast. As noted previously, the OS policy would be to show the entirety of the area seaward of the route, which is potentially coastal margin, under a “magenta wash”. A conservative estimate of the proposal shows that at least 75% of the potential margin will fall either under excepted land (arable, buildings and their curtilage, etc) or excluded land designated by Natural England for either Public Safety reasons (S25) or Habitat Protection (S26). This would make the OS default depiction grossly inaccurate. The maps provided do not adequately reflect the key spatial relationships between the path, protected habitats and coastal margin, and make it exceedingly difficult to make judgements. There is only one map that depicts the entire route (index map), within each chapter separate maps show sections numbered for comment, no map showing the route for each entire chapter is provided, and only landward spreading room is depicted, no excepted or excluded areas are shown. Maps of exclusions appear in the separate Overview document and don’t show path or even other exclusions that overlap the map area depicted. 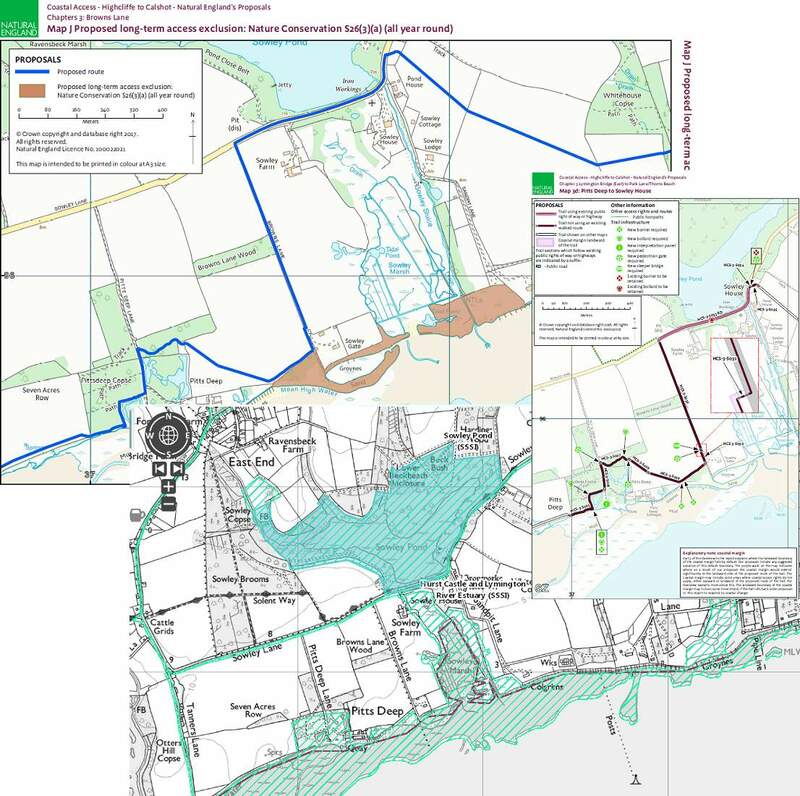 None of the maps of paths or exclusions show the relevant areas of habitat designation (SSSI, Nature Reserves, SAC, SPA, Areas of Special Protection and Ramsar Wetlands). As an example of what would be useful, you’ll find attached my approximate overlay map of the route shown in orange (part of Chapter 3, and all of Chapters 4 and 5 of the proposal, the Orange diamonds showing the chapter divisions). The North Solent Site of Special Scientific Interest is outlined in magenta pink with diagonal hatch, and the Solent & Southampton Water SPA is shown in orange with vertical pinstripe. Areas wholly excluded from Coastal Margin year round under Section 26 Nature Conservation are depicted with a grey overlay. 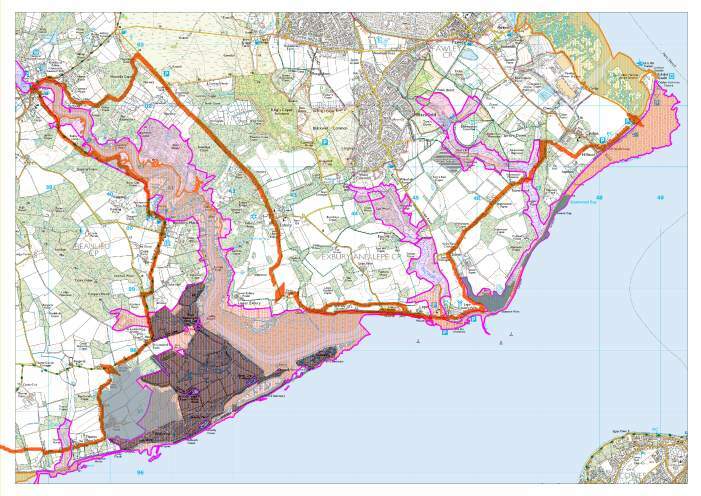 Section 25a Exclusions under Public Safety are not depicted, but to the Salt Marsh and Flats portion of the SSSI along the Beaulieu estuary (but not its terra firma), and similar areas from the mouth of the Lymington river and including Keyhaven (not on the map) and Solent shore. It would also be useful to have maps in each chapter clearly delineating which sections are “new” as opposed to those that are part of existing Rights of Way, Highways etc. 3.—(1) Land in England is coastal margin for the purposes of Part 1 of the CROW Act (access to the countryside) if it falls within one or more of the following descriptions. (c) land which is seaward of the line of an approved section of the English coastal route and lies between land within sub-paragraph (b) in relation to that approved section and the seaward extremity of the foreshore, if the land within sub-paragraphs (a) to (c), taken as a whole, is coastal land. (c) when taken together with land within the first description in relation to the approved section, is coastal land. (b) land which is adjacent to and within 2 metres either side of that line. (b) land which is adjacent to and within 2 metres either side of that line, to the extent that the land is within section 55I(4)(d) of the 1949 Act(b) (land over which the owner has agreed the temporary route may pass). We believe that Natural England have been overly inclusive in their interpretation, 1) the order has no scenario to reflect what to do with the coastal margin should the “coastal land” the foreshore etc., be excluded for habitat or safety reasons, it should not follow that the margin leading up to excluded areas should be included 2) this becomes even murkier where the path must travel away from the coast up an estuary to the first foot crossing, particularly one so protected as the Beaulieu – Natural England have the option to terminate the path either side, but avoid this to keep the route contiguous and not create demands for honey pot infrastructure and the terminal points. The Natural England consultation on this stretch runs until 9 May 2018, more information, criticism and analysis may be found on our website newforestassociation.org. Habitat and Landscape Chair, Brian Tarnoff reviews with uncharacteristic brevity the past year on the Forest Design Plan, Recreation Management Strategy and the England Coast Path. Part of our series of Annual Reports relevant to our AGM on Saturday 21st April 2018. Updates since original publication, reflecting these ever changing issues, are provided below each section. Once again I am full of gratitude and amazement at the generous contributions of our committee members this year. This included countless hours volunteered to pour over one of the most vital consultations we’ve seen in some time, and days spent trudging the Forest in all weathers on site visits for works proposed by the Forestry Commission on the open Forest. Consultation continued this year. Our ecologists took part in round table discussions on this year’s draft, a palpable improvement over the March 2016 version. The detail, which had concerned us previously, now was much more in line with the commitment from the 1999 Minister’s Mandate (strongly supported by subsequent policy) to restore pasture woodlands, heathlands, valley mires and Ancient and Semi-Natural native woodland, and favour broadleaves over conifer. In these meetings, Forestry Commission staff expressed sound underlying principles that would serve this plan, both in its current form, and going forward, to manage towards these goals. Our main quibble is that the documentation of the plan does not adequately express those principles. This may seem a small thing, given how close the detail plan is to delivering many of our Association’s goals, but without them in place the plan may not be able to show its logic adequately to stand on its own against Habitats Regulations Assessment, or possible changes in future management of the Forest which could veer away from the promise this plan holds. After the public consultation on the plan, the Forest Services review determined that consent under EIA regulations is required for the deforestation proposals (some areas being returned to open Forest habitats). Forest Enterprise has been tasked with producing an Environmental Statement for consideration, and we are amongst the stakeholders invited to a scoping exercise in January 2018. DEFRA have agreed to roll forward some elements of the FC’s expired felling license, which was dependent on the now unknown date for approval of the plan by the Inspectorate for renewal. In a similar spirit of openness the Forestry Commission proposed a Wetland Restoration Strategy at a well-attended December workshop including representatives across the spectrum of the debate. In addition to more constructive engagement with all stakeholders, we hope this will lead to a monitoring program that is apt, affordable and will adequately support future efforts. The FC have just updated us (12/04/2018) with a view of present and future monitoring plans. We believe these will be robust and adequately adapt and augment standard river monitoring techniques to the unique challenges of the New Forest’s streams and wetlands. We hope sufficient funding will be allowed to cover a range of catchments including both restored and untouched. Understandably our section of Coast, with a nearly uninterrupted series of very protected habitats (some garnering between four and five layers of designation, nationally and internationally), has been a very thorny problem for Natural England, who have nudged the consultation forward throughout the year. Once mooted for March 2017, now February 2018 (the original target date for implementation was March 2018). Although a habitat adjacent inland route may be viable, the coastal margin created by the default spreading room designated in the Marine and Coastal Access Act 2009 would potentially create up to 3,500 acres of new access land on these easily disturbed habitats, where it would cause irreparable damage. We hope that Natural England will exclude these, but even if they do, the Ordnance Survey will not show those exclusions. Our main role currently seems to be to remind one and all of the immense importance of our Coast with greater fragility and importance than the precious habitats of the Crown Lands that typically draw our focus. The eight week consultation on the Highcliffe-Calshot stretch finally began on 14th March 2018 and is due to run until 9th of May 2018. The route itself (barring some quibbles) is reasonable, however the exclusions for spreading room are either incomplete or lacking classification for habitat protection. The consultation documents themselves are of greater scale and complexity (the sensitive features appraisal alone, at 215 pages is three times larger than the equivalent document for any of the other published stretches), and yet we’re expected to comment on them within the standard 8 week consultation window. The Sensitive Features Appraisal is rife with error and stops short of a full Habitats Regulation Assessment (relying on flimsy mitigation measures which have failed elsewhere). We could go on (and we will elsewhere…. ), but in short, the needs of our habitat point up severe flaws in the legislation, specification and consultation processes. The welcome review of the NPA’s Recreation Management Strategy has been mentioned above in this annual report. Unfortunately the public survey reiterated paragraphs from the current strategy alongside each potential subject heading, leaving some confused as to whether to respond to these remarks or implicitly approve them? For our response we asked that the next RMS should feature priority projects with clear objectives and timeframes. We proposed a comprehensive review of recreation infrastructure within the park, including surveys of habitats, campsites and parking, with actions leading to a provision that is ‘Fit for Purpose’. We proposed initiatives to raise the profile of the National Park so the decision makers of adjacent Authorities and communities become more aware of their impacts on the Forest and ‘Section 62 Duties’, create adequate, proportional mitigation, and petition Central Government for more strategic targets to take pressure off the Forest. We also asked for clearer messages in Education that would easily highlight the Forest’s need for protection as a National Nature Reserve, Working Farm and Working Forest. Our full response to the RMS survey is here. Subsequent remarks on the Park Authority’s flawed draft interpretation here. Along with Associated British Ports revisiting their goal of a deep-water container port at Dibden Bay, our Association and the whole of the Forest will be facing many challenges for renewed development of the already heavily urbanised Waterside. This includes the proposal by Fawley Waterside Ltd for the development of a new town, with an estimated population of 3,500 on the site of the Fawley Power Station. The development on the brownfield portion of the site, originally exempted from the National Park, might be hard to resist, but the current proposal includes a ‘village’ built out into the National Park on Tom Tiddler’s Ground*, which is a young coastal grazing marsh and forms a rough habitat that is prime for rehabilitation. * Tom Tiddler’s Ground is considered over several pages in committee member Clive Chatter’s tome Flowers of the Forest. Finally, we should note that many of our committee members were involved in steering the process which led to the purchase by the RSPB of a major landholding in the Forest, now to be known as RSPB Franchises Lodge. We’ve been embargoed from discussing this effort as it has unfolded over the years (and at long last announced on 23 Mar 2018). I wish to thank the RSPB for the purchase, and the members of our committee who identified and shepherded this opportunity to fruition. With our AGM fast approaching on Saturday 21st April 2018, this and next week we’ll feature our annual reports. NFA Chair John Ward reports on the work of our council and trustees on both this year’s work and our 150th Anniversary celebrations. Formal meetings of Council were held six times and for the Board of Trustees four times during 2017. In addition there were regular meetings of the Habitats and Landscape Committee and the Planning and Transport Committee; and also ad hoc meetings of the Education Working Group. At the end of 2017 there were eight trustees and sixteen nontrustee members of Council. We have held informal liaison meetings with the National Park Authority and Forestry Commission; and attend various New Forest forums and working groups including the Consultative Panel and meetings of the Verderers Court. The Friends of the New Forest were in evidence on stands at the New Forest Show and at Roydon Woods Woodfair. Sponsorship funding support was given for the animal accident ‘advert’ on the back of the New Forest Tour bus through 2017; and also for the ‘Our Past Our Future’ projects for ranger training and for habitat restoration. The Association had previously committed to support the project to develop housing for commoners at Rockford farm and during 2017 we contributed to the costs of preparing drawings and making a planning application. On the research side we made a funding contribution to the New Forest Curlew Project. 2017 was, of course, our 150th Anniversary year. At the end of 2016 we launched “Saving the New Forest”, the book written by Peter Roberts telling the story of our Association. It has been selling well throughout 2017. The story of the Association and the New Forest from the mid 19th century until today was put together into a slide show presentation. This has been given to more than 20 groups, reaching over 1,000 people most of whom had not previously heard of us and gaining donations to support our work to protect the Forest. We organised and hosted the National Parks Societies annual conference, held this year in October at Balmer Lawn Hotel and attended by 50 delegates from other national parks, the Campaign for National Parks, other national bodies and New Forest organisations. During the year our Anniversary programme provided 16 events. Walks and visits included, the Verderers Court and Lyndhurst Church, Archaeology in Sloden Inclosure, Caring for Pondhead Inclosure, Needs Ore, Rockford and a Fungi Walk at Rans Wood. Following the AGM there were options to visit Furzey Gardens or Minstead Study Centre. Lunch at MJs restaurant was attended by our Patron, Belinda Lady Montagu, and President, Oliver Crosthwaite-Eyre, together with NFA members and trustees, affiliated Parishes and representatives from the Forestry Commission, Verderers, Commoners and National Park Authority. Council members and invited guests gathered at the Crown Hotel in Lyndhurst on the 22nd of July to raise a glass and mark the day on which the New Forest Association was founded. We held two receptions and exhibition private views – The New Forest Open Art Exhibition at the New Forest Centre, and New Forest Bird Sculpture by Geoffrey Dashwood at St Barbe Museum and Gallery. Purely social events proved to be less popular with Friends of the New Forest and a summer garden party and an autumn golf day were cancelled due to lack of support. Unfortunately the intended Frohawk Walk was also cancelled at short notice due to a gypsy drive-in clashing with this event. Ours was not the only anniversary this year. It was the 800th anniversary of the New Forest Charter and panels about the New Forest Association were included in a display at the New Forest Centre. In November we hosted a small delegation from the Anglo-Portuguese community who visited the New Forest in November to mark the 100th anniversary of the arrival of 150 Portuguese troops to assist with timber production for the war effort. Two large events for 200 people, both of which were booked out with waiting lists, provided the bookends for the Anniversary Year. The first was “What Future for the New Forest – A Foot in the Past and an Eye to the Future”, with a keynote address from Council member, Clive Chatters followed by responses from Alison Barnes, Chief Executive of the New Forest National Park Authority, Bruce Rothney, Deputy Surveyor for the New Forest and Dominic May, Official Verderer, together with the audience. Clive identified the management of recreation in the Forest as being a key issue, and concluded that ‘this generation’s responsibility to secure the future of the Forest now lies with us’. By the end of the evening there seemed to be an emerging consensus, particularly with respect to recreation management, that it feels like ‘one of those moments for bold decision making’. Our final, very well attended event was “An Evening of New Forest Films with Lord Montagu”. This was hosted at the John Montagu Theatre in the Beaulieu Motor Museum, and featured a fascinating array of archive footage of the Forest, some not publicly viewed previously. We thank both Lord Montagu and Dr. Manuel Hinge for this most fitting closing event for our Anniversary year, and their untiring efforts to preserve films that provide an historical, cultural, and community window on the Forest. Recreation management continued to be a major issue for us through the year. There have been several presentments to the Verderers Court echoing similar concerns, and at the New Forest Show the National Park Authority launched a consultation on reviewing their Recreation Management Strategy. We responded to this consultation and also opened up a dialogue on the subject with the Forestry Commission. We believe this is the most pressing issue needing to be addressed within the Forest and significant action must to be taken to review and change the recreation infrastructure within the Forest. To succeed his must be driven by the statutory authorities with as much vision as those who implemented the 1971 Conservation of the New Forest proposals and not just end in fine words but with little tangible effect. In what may be an advance preview of the next Recreation Management Strategy, a whistleblower has come forward with information indicating plans afoot to pave the entire Forest to put up a parking lot. The whistleblower, only willing to be identified by the handle JMitchell@CanyonLadies70, has hinted at other coming developments, but it is unclear whether these plans are from the National Park Authority or the District Council. For now, the locations are vague (a comment about boutiques has suggested Lyndhurst), but, with some deduction, there is a chance that the Lyndhurst Park Hotel will be released from its development limbo to reopen under a fresh coat of pink paint and with a new entertainment venue described as a “swingin’ hot spot”. The deforestation resulting from this paving project will require relocation of some conifers, and ostensibly large deciduous plants for viewing by the public. Another surmise is that this display may be in the New Forest Centre. However, no representatives of the Ninth Centenary Trust who run the Centre could be contacted on this proposed conversion of the Centre to a tree museum, nor the plan to abandon the Centre’s free entry policy to charge the people a dollar-and-a-half (just over £1 pound sterling, as determined by American tourist focus groups, as what it would be worth “just to see ‘em”). The Forestry Commission has also been unavailable to comment on whether the proposed deforestation is within the scope of their Forest Design Plan, and the rumour that glyphosate may not be available post-Brexit, requiring use of the even more controversial DDT for control of pest plants like the non-native rhododendron. The informant did express concerns, which we believe are unfounded, that this may affect their right to forage for apples on the Crown Lands; although we do concur with worries over the effect of the pesticide on birds and the declining population of bees. When asked why he/she had come forward, the whistleblower said that people “don’t know what they’ve got till it’s gone”. In this reporter’s experience it does always seem to go that way. When confronted with the NFA’s research showing no known basis of these plans from any of the relevant authorities, the informer fled the café, slamming the screen door on the way, and hopped in a big yellow taxi which sped off. It is worth noting, that beyond the lack of corroboration, the meaning of this article will evaporate to mere satire by noon on the date of publication. Whether the satire is weak, or based on deeper truths, is entirely up to you, dear reader. If we have inadvertently misled, feel free to contact the relevant authorities, be sure to tell them “Shooo bop bop bop bop!” (with apologies to J Mitchell). Error: Error validating access token: Session has expired on Sunday, 10-Mar-19 01:16:56 PST. The current time is Wednesday, 24-Apr-19 23:31:30 PDT.